Accelerators: used to prevent plaster from setting too slowly, to avoid dryout in hot dry weather and ensure normal strength when it does set. Acoustic or Acoustical Plaster: Plaster with pores in the set plaster or minute spaces bweteen the binding material, fibers and aggregates that 'soak up' sound. Admixtures: Ingredients other than aggregate binders and water that are added to plaster, like accelerators or retarders. Aggregate: Added to conventional gypsum plasters to extend coverage, reduce shrinkage and lower cost - e.g., sand or perlite. Alkaline: a pH greater than 7; a base, caustic. The opposite of acidic. Lime is alkaline. Alkaline-resistant Paint: A paint like an oil alkyd or masonry paint used to prime or paint plaster. Angle Float: Used for inside corner work with conventional plasters. Asbestos: Used in many products since the early 1900s - 1980s, due to high tensile strength, flexibility and resistance to heat, chemical and electrical conditions. Some acoustical plasters (e.g., those used in the 1920s) contained asbestos. It was usually the white finish coat over a brown/base coat applied to wire lath, and was typically white to gray. It was also mixed with other materials and sprayed on ceilings and walls to produce a soft, textured appearance. It was sometimes added to wall plaster during the 1910s through the late 1920s. Base Coat or basecoat: This term is used for two coat plaster. It is a doubled-up coat. Although it is relatively thin, it is extremely strong. Fills in voids and imperfections. 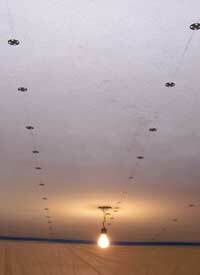 Avalanche Plastering uses 3000 psi impact-resistant plaster which prevents visible screw pops. Blisters: Water-soluble, powdery crystals on the surface, generally white, can be brushed off. Caused by too much water in a plaster mix, over troweling, or too dry a base or brown coat. Bond Failure: Base coat separation. Usually due to improper job conditions during plastering, incorrect mixing and application, or a weak scratch coat. Brown Out: When plaster begins to harden, and turns brown in color. Browning Brush: used to throw water on the surface of applied mortar to slip or lubricate the tools used for straightening. Browning Rod: A tool run across the surface on brown or base coats for leveling. Also known as a straight edge. Caster: A craftsman who works from a model to make a mold out of glue, rubber or plaster to reproduce an ornamental feature. Cat's Eyes: Voids in the surface of plaster. Cement Board: Strong, stable, heavy sheets made of aggregated and reinforced Portland cement. Typically used as a backing board for tile, but also as a substrate for veneer plaster for improved impact strength and abrasion resistance (e.g., schools or high-traffic retail locations). Can be nailed or screwed to wood or steel studs. Highly resistant to moisture. Cement Brush: A tool dragged across the scratch coat of plaster to roughen it for the second or double-coat. Cement Masons: people who lay concrete floors, sidewalks and roads. Cement Plaster: a mixture of plaster sand, Portland cement, lime and water, applied to masonry or wire mesh, usually on surfaces exposed to weather. Chip Cracking: Short, patterned cracks in the finish coat. It does not happen if the finishing plastered is applied over a damp base coat. It can be caused by overuse of retarder, a base coat that is too dry, hot dry air directed at the finish, badly prepared putty, or not enough gauging plaster or troweling. Crumbling: Soft, weak surface caused by use of too much sand aggregate or retarder. Darby: A long, thin, flat blade used to float/smooth over freshly rodded brown mortar. Delamination: of base coat or mortar happens as a result of improper mixing or improper basecoating technique. Durabond™: a setting type joint compound, that is mixed from powder, hardens quickly and sticks well. It contains Plaster of Paris. Dryout: Soft, weak surface caused when the plaster dries so quickly from dry heat (e.g., from weather or hot air from a furnace) it doesn't have time to set hard. It is prevented by covering openings so direct wind doesn't strike the wet plaster. Drywall: Generic term for Sheetrock™. Efflorescence: a white, powdery salt-like deposit on the surface of masonry or plaster, caused by salts in the mortar or base coat. Also called whiskering or saltpetering. Fasteners: We use special corrosion-resistant, high impact screws and fasteners. Fat Dribbles: The milky residue of plaster that remains after water troweling. Feather Tool: A broad tool like a straight edge except is is tapered to enable feathering at corners, etc. Felt (or Blister) Brush: Used in water troweling and final removal of fat dribbles. Fiberglass Mesh: gives plaster integrity and helps keep it from cracking. Alkaline resistant mesh is not affected by alkaline materials and won't deteriorate over time. Avalanche Plastering uses heavy duty, 4.5 oz. alkaline-resistant fiberglass. Finish Coat: the final layer of plaster applied over a basecoat or other substrate. It can be burnished with a specialized trowel to a smooth, glass-like sheen. Avalanche Plastering applies this over the double-coat, and uses a two-coat application method. Finish Troweling: Done as soon as material becomes sufficiently firm, leaving a finish that is free from trowel marks, voids or other blemishes. Finishing Brush: used to apply water directly to the plaster surface. It must be of good quality to avoid scratching soft plaster. Flanking in: Applying a thick layer of putty and plaster. Float: A tool used to level and straighten the finish coat or correct surface irregularities. Can also be used to produce a sand-finish effect. Float or Spray Texture Finish: attractive durable finishes where surface texture is designed. Frozen Plaster: Plaster that freezes before it has set (which will have to removed) or after it has set (which can usually be thawed out). Usually detected by a white fuzz on the surface. Furring: Member or means of supporting a finished surfacing material away from a structural wall or framing. used to level uneven or damaged surfaces. Gauging Plaster: Super hard special plaster blended into lime putty to provide controlled set, early hardness and strength and to prevent shrinkage cracks. Avalanche Plastering uses Structo-Gauge, which produces s high-strength, durable white smooth-trowel finish with excellent hardness and abrasion resistance. Green: Plaster that is set, yet is still wet and has not cured completely. Grounds (Plaster): What a plasterer calls a screed, also sometimes called base beads. It is a piece of wood or metal attached to the framing or plaster base that acts as a gauge to determine the thickness of the brown coat, and also provides a straight edge. Gypsum: a soft mined mineral composed mainly of fully hydrated calcium sulfate (CaSO4 2H2O) or calcium sulfate dihydrate. Gray to white in color. Fire resistant and adaptable for construction purposes. Hair: Typically horse or ox hair that was mixed in with plaster as a binder, to add strength. It is no longer used in most modern plasters. Avalanche Plastering uses USG Red Top wood fiber plaster. Hardwall: A scratch and brown coat of plaster in lieu of soft gypsum drywall. It is specific to conventional plastering. Hawk: a tool that holds a supply of mortar for immediate use. The trowel is used to pick up mortar from the hawk and apply it to the plaster base. Home Improvement Contractor's License: Required in some states. Protects the homeowner. Avalanche Plastering is licensed in Connecticut and Fisher's Island and Suffolk County, NY. States strongly urge consumers to work only with registered contractors. See What to Look for in a Home Improvement Contractor. Hydrated Lime: Quicklime that has been slaked without being saturated with water. It is a dry powder with just enough water to supply the chemical reaction. Fiberglass Mesh: While the hot mud is still wet, Avalanche Plastering trowels in heavy 4.5 oz fiberglass mesh over the entire surface to tie the whole ceiling or wall together and prevent cracks. 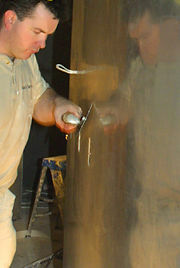 Float Finish: A sand float finish, usually done with a sponge. It is not a hard, pressed finish. Keenes (or Keene's or Keane's) Cement: almost pure anhydrous calcium sulphate which sets much more slowly than Plaster of Paris. There are two types - regular (slow setting) and quick setting. The only kind of plaster that can be retempered. Sometimes used for color or lime-sand float finishes. Key: Space for mortar. Interlocking 'nibs' or grip where the plaster protrudes through lath, reinforcing the bond between the plaster and the wood. May be accomplished by wet mortar penetrating into paper fibers, scoring irregularities, perforations (e.g., in fiberglass mesh) or lath. Lath: Narrow wooden strips, usually white pine, spruce, fir, redwood or other soft, straight grained materials Usually 5/16" x 1.4" x 4", and nailed to studs or joists. Today may be metal or gypsum. Part of a structure used as a base for plaster. Lather: tradesmen who strictly installed lath systems as a base for plaster. They are no longer very common. Lime: Calcium oxide or hydrated calcium oxide. It is a mineral that is very active chemically and is extremely alkaline. Lime Mortar: historic plaster mix of lime and sad with enough water to make it plastic. Lime Putty: Powdered lime mixed with water. The resulting putty is later mixed with the gauging plaster. Liquid Bonding Agents: Used in the brown and finish coats to coat old, rough antique finishes without chopping the old finish off. Recommended over flanking in. Can usually be done without removing trim or baseboards. Machine Mixing: instead of mixing batches of plaster by hand, Avalanche Plastering mixes it with a heavy duty drill that spins at 900 RPM, which ensures proper workability. Map (or Craze) Cracking: A series of long, irregular, fine cracks. May be caused by weak brown mortar (e.g. applied too thinly or over sanded), vibration (e.g., near highways), or big temperature changes (e.g., on suspended metal lath ceilings). Mechanical Bond: When plaster penetrates into or through a substrate. Mechanical Mixing: Uses a mixing paddle driven by a heavy-duty high speed drill that disperse and blends ingredients by shearing rather than folding. Mandatory for veneer plaster finishes. 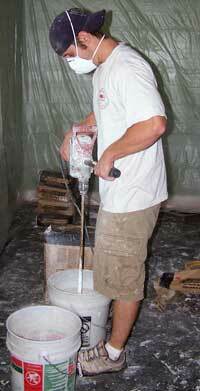 Proper mixing is essential to maximum plasticity of mortar. Molding Plaster: Calcined gypsum ground very fine to bring out details in ornamental trim, cornices and cast work. Mortar: Mixture of gypsum plaster or Portland cement with aggregate or hydrate lime and water. Nail Pops: When small areas over the nail head fall off and you can see the nail. Usually caused by wood that shrinks or was improperly cured. Ornamental Plaster: Decorative treatments such as crown mouldings, rails, lintels and wall and ceiling details. Features are often screeded in place. More intricate forms are molded and the formed pieces are later mounted in place. One Coat: Where one coat of finish plaster goes right on the blueboard. Avalanche Plastering prefers a two coat system. Over sanding: Usually caused when plasterers who are trying to save money add extra sand, which seriously weakens the mortar, causing the finish coat to crack and loosen. Overly Retarded Plaster: When the plaster has too much retarder and does not set. If it is left on, it will dry out and get soft and powdery. Patching: repairs and alterations to existing plaster. Use of a well aged putty and enough gauging plaster results in a hard, well-bonded patch. Patching requires as much workmanship as new plastering, and a careful workman can restore it to excellent condition. Perlite: A naturally occurring amorphous volcanic glassy mineral with a relatively high water content. Plaster Mix: A combination of an aggregate, a cementing material (binder), and water. Plaster of Paris: A type of building material based on calcium sulfate hemihydrate. It is made out of gypsum. Plasterer Tender: The person who mixes materials for the plasterer, puts up scaffolding, and cleans up. Sometimes called a hod carrier. Plaster (repair) Washers: Galvanized steel washer with a countersunk screw hole in the center, and additional holes in the washer to allow the plaster to mechanically bond to it. They are used in resurfacing. Plaster Work: May refer to plain plastering of walls and ceilings, or ornamental work (mouldings, figures in relief or sunk into the surface). Portland Cement: A common type of hydraulic cement used in concrete, mortar and stucco and non-specialty grout. Used in interior applications where high-moisture conditions exist, or for exterior stucco. Quicklime: Calcium oxide (CaO), which is made by burning or calcining limestone rock. It is very caustic. Remixing: Mixing plaster a second time after it has stiffened or started to set. With the exception of a plaster finish called Keenes Cement, plaster should never be re-tempered, so once mixed, that is it, and Avalanche Plastering never remixes. Doing so would significantly weaken the plaster. Resurfacing: (of old plaster) Applying a new plaster finish over the existing surface. Retarders: used to extend setting time for basecoat plaster. Running (a mold): forming an ornamental plaster feature like a cornice, using a mold in repeated runs or passes to develop the shape. Scaffold: Portable metal stands with diagonal braces, which creates a platform the plasterer stands on to reach high areas. Scagliola: imitation marble finishes developed in Italy in the 15th century. Scarifier: A wire-barbed tool for raking the wet surface of the scratch coat, so the brown coat can key and bond correctly. Scarifying or Scoring: Roughing up or raking the surface so the subsequent brown coat has grooves to "bite" into, and can mechanically bond to the scratch coat. Screed: A strip of plaster or wood drawn across a surface to be plastered to serve as a guide for making a true, level surface. Also used as a verb to mean straightening or leveling with a rod or similar tool. They are created between plaster grounds. Set: Harden and hydration of gypsum plaster or setting-type joint compound. Setting Time: How long it takes for the basecoat to harden. Retarders can be used to extend setting time. Sgraffito: laying coats of different colors of mortar, one over the other. While the coats are still soft, portions of the top coat are removed (e.g., with a stencil or wire brush), exposing the color underneath. Sheetrock™: Gypsum board or plasterboard, used for interior walls and ceilings. A USG brand name for drywall. It is made of a paper liner wrapped around gypsum plaster. It is inexpensive, and fairly easy to install. It became popular in the 1950's. Slake: Adding water to convert quicklime to hydrated lime. Slicker: A tool with a beveled edge used to level and smooth plaster coats. Skim Coat: A loosely used term where joint bond, spackle or Durabond™ or plaster is smoothed over a surface. Skip Troweling: A heavier decorative finish. 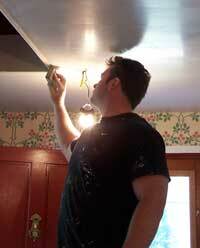 It is usually done on ceilings to save cost, in part because it doesn't need to be painted. Stains or Staining or Rusting : Caused by use of improper fasteners or exposed, improperly prepared metal trim. Stilts: Strapped onto legs to allow the plasterer to reach high areas like ceilings. They have articulated joints to flex with ankle movement. Stucco: a mixture of an aggregate, binder and water used to coat walls and ceilings and for decoration. Usually used outdoors. Traditional stucco is made of lime, sand and water. Modern stucco is made of Portland cement and water. It is very hard and brittle, and prone to cracking. 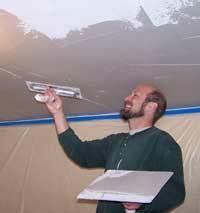 Avalanche Plastering does stucco repairs, patches, and specialty jobs (e.g., an porch ceiling). Sweatout: Occurs when their is too much moisture (e.g., from lack of air circulation) and the plaster does not set. Windows should be left open a little. Trowel: Plasterers used a specialized flat stainless steel finishing trowel that is rigid but has just the right amount of flex. Trowels are used to apply, spread, shape and smooth materials. Avalanche Plastering usually uses new trowels to scratch and double the plaster to achieve a flatter surface. Trowel Lines: Line marks in the plaster from the metal tool. Avalanche Plastering uses three strokes in a continuous motion when troweling to minimize lines. Two Coat System: A finish coat of plaster over a base coat. Can also be used over a masonry base like brick. Veneer Plaster: One or two coats of thin plaster over sheets of special gypsum board called Blueboard. Avalanche Plastering uses two coats for superior leveling and durability. A strong, highly abrasion-resistant surface. Vermiculite: Silica, magnesium, aluminum oxides and some other minerals, used as an aggregate in plaster. Wire Mesh: Galvanized expanded metal wire used in conventional plaster, woven or welded. It comes in light duty 2.5 lb or the heavier 3.4 lb weight. Avalanche Plastering will only use the sturdier 3.4 lb weight. Wood fiber plaster: has shreds of wood fiber in the mix, greatly strengthening the scratch and brown coats. Plastering: Skill and Practice , by Van Den Branden/Hartsell, 1984, second edition.